BAR HARBOR, MAINE — The MDI Biological Laboratory has announced that Sam Beck, Ph.D., has joined the faculty as an assistant professor of computational biology. Beck, 37, will lead a research team focused on the study of progeria, or Hutchinson-Gilford progeria syndrome, a rare, fatal, genetic condition characterized by accelerated aging in children. The name, which is derived from the Greek, means “prematurely old.” Patients display characteristics of accelerated aging within the first two years of life. The aim of his research is to gain new insight into the genetic mechanisms underlying aging in adults with the ultimate goal of developing drugs to extend healthy human lifespan and slow the onset of age-related degenerative diseases. In addition to more traditional laboratory approaches, Beck uses computational biology and bioinformatics to understand the biology of aging, as well as the biology of cancer stem cells. Computational biology and bioinformatics analyze large biological datasets using computer science, statistics and mathematical modeling to understand biological systems and relationships. 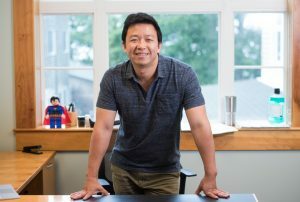 Beck (Samyeol Baek) comes from the Department of Molecular Biosciences at the University of Texas at Austin, where he was a post-doctoral fellow. Prior to that, he was a post-doctoral fellow in network biology at Yonsei University, Seoul, South Korea. He earned his doctorate in animal cell biotechnology from Seoul National University. His interest in biology was triggered by an experience of childhood illness in his native South Korea, where he spent two years in children’s hospitals as a toddler due to an undiagnosed illness. The suffering of his fellow patients inspired him to pursue a career in biomedicine. His interest in computational biology was also inspired by life experience — specifically, a need to do more with less. When he learned that publicly available data could be used to design good experiments and save time, effort and money in doing so, he sought out the computational tools to extract useful information from such data. Beck is thrilled to be in the United States because “this is where science happens,” and on Mount Desert Island because of its beauty and the strength of its scientific community. “I love this place,” he says, adding that as a native of one of the world’s most densely populated countries he values the immediate access to nature. Beck’s research is funded through a COBRE (Centers of Biomedical Research Excellence) grant from the National Institutes of Health to support research on aging and regeneration. He lives with his wife, a computational biologist who works remotely for the Texas Advanced Computing Center in Austin, and infant daughter.